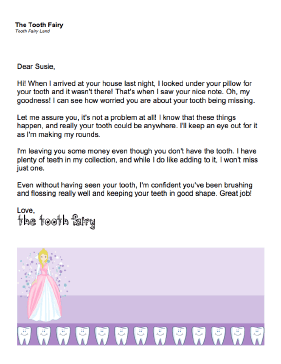 If a child literally loses a tooth (as in, loses track of it after it falls out) this printable letter from the Tooth Fairy lets him or her know that it's OK and money will still be given. Hi! When I arrived at your house last night, I looked under your pillow for your tooth and it wasn't there! That's when I saw your nice note. Oh, my goodness! I can see how worried you are about your tooth being missing. Let me assure you, it's not a problem at all! I know that these things happen, and really your tooth could be anywhere. I'll keep an eye out for it as I'm making my rounds. I'm leaving you some money even though you don't have the tooth. I have plenty of teeth in my collection, and while I do like adding to it, I won't miss just one. Even without having seen your tooth, I'm confident you've been brushing and flossing really well and keeping your teeth in good shape. Great job!